Historian Bernetiae Reed (left) and archivist Josephine McRobbie prepare portable archiving kits at UNC-Chapel Hill’s Wilson Library. 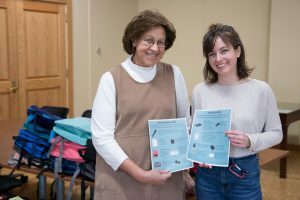 When Josephine McRobbie, an archivist at the University Libraries, prepared for a recent trip to San Antonio, she did not stock up on typical travel supplies. Instead, she commandeered a large room in Wilson Library, covering the conference tables with audio recorders, notebooks, portable scanners and 30 backpacks and roll-aboard suitcases. The project is one element of a three-year, $877,000 grant from the Andrew W. Mellon Foundation. Through the grant, SHC archivists promote community-driven archiving. By partnering with individuals and communities, the SHC aims to support grassroots efforts to record and preserve local history. The archivists provide training, technical know-how and, now, supplies and equipment that will make the job easier. 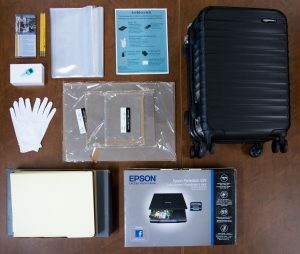 The bags and backpacks contain items to assist a community-based historian conduct and record oral history interviews and begin assembling photographs, letters, documents and meaningful artifacts. McRobbie says that when community members learn these skills and gain familiarity with common tools and equipment—from acid-free folders to portable audio recorders—it is empowering. A rolling suitcase contains items to help community-based historians begin building a local archive. “It builds their sense of identity as historians and community archivists. It gives them the authority to plan and carry out the projects that they care about,” McRobbie said. The SHC currently partners with four community archiving projects. McRobbie brought several of the kits with her in early April for the San Antonio African American Community Archive and Museum. Others will go in coming months to the Appalachian Student Health Coalition, the Eastern Kentucky African American Migration Project and the Historic Black Towns and Settlements Alliance. Above all, McRobbie and her colleagues want people to know that telling the stories of their own lives and their home communities is well within reach, and that the rewards can be tremendous. “An effort doesn’t have to be archivally perfect in order to be successful,” she said. Simply making good records of what is gathered, and keeping everything in a cool, dry place, will go a long way toward preserving stories for future generations. McRobbie and her colleagues at Carolina continue to refine the program as they go along. In the second and third year of the project, they will assess the work done to date and create new kits based on user feedback. They will also share their experience with additional community partners and with the archival profession. The Southern Historical Collection website includes information about its commitment to community-driven archiving or contact the SHC at (919) 962-1345 to learn more. For additional photographs from backpack-packing day, please visit the Library’s Flickr site.